The Lake Raystown Resort, set upon 400 acres, is a resort area set upon Raystown Lake, the largest lake fully within the borders of Pennsylvania. We cover some of the background and scenic beauty of the lake in this article from last week. We went to the resort to have a hearty lunch before heading to the Swigart Museum, which we will cover later this week, and the awesome Thousand Steps Trail. The resort is an RVC Outdoor Destination, a company that runs a series of campgrounds across the country. They have a lodge, convention center, restaurant, waterpark, marina, beach, and more at the resort. The waterpark! They also have two waterslides, making for a relaxed little waterpark experience. Our main draw to the resort was to get a bite to eat. Great views and delectable food make this a great place to relax for a little bit. The food portions were fantastic, and the pricing was reasonable as well. I could not resist the crab cake sandwich, while Brit had the biggest club sandwich that I've ever seen. We took a stroll around the marina area after we were done eating. As with the rest of the lake area, it was absolutely beautiful. They have a little amphitheater set up for weddings. They frequently host them right at the marina. The resort has a couple of houseboats available for rental. The beach and some of the accommodations next to it. The Lake Raystown Resort is a fun place to come and relax a bit. The resort was pretty popular, between the accommodations, waterpark, swimming, boating, and the restaurant. The food was delectable at the restaurant, and we highly recommend it. For more information, here is the website for the resort. 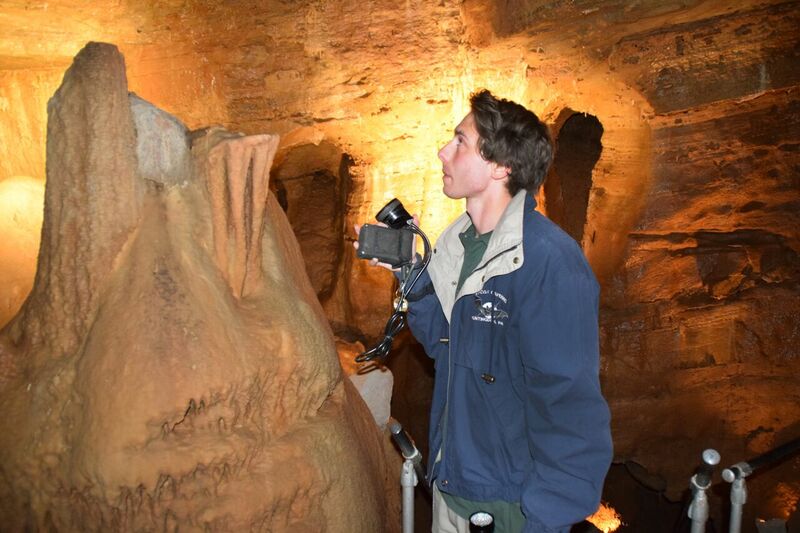 Today we visit Lincoln Caverns, a family institution based around a geologic wonder. Want to go some place to cool down during the brutal summer heat? Lincoln Caverns is a great place to go for that. The caves remain around roughly 50 degrees fahrenheit year-round, making for a great place to go and cool off beneath the surface in Pennsylvania. The namesake, Lincoln Caverns, is only one of the two show caves on the property, making this a rare place where you are able to visit two different show caves under one admission. The formations and the overall awesomeness of exploring these caves make this place a must for you to visit. The caverns were found by accident in 1930 while they were constructing the historic William Penn Highway/Route 22. The original owners were farmers and opened the caves as the 'Hi-Way-May Caverns.' They had it open for only one season, and they put it up for sale. Myron Dunlavy Sr. was a working man whose day job was with a telephone company, but had a stake in the entertainment business, being involved in vaudeville, a circus, operating an amusement park, and more. One of his odd-jobs was in liquor enforcement in the Prohibition era. He would often find illegal stills in caverns, and as a result of this job, he gained an appreciation for these underground wonders. He even went as far as to put out advertisements asking if anyone had any caverns for sale. This lead him to lease and eventually purchase what would become Lincoln Caverns. Now we will descend into the depths of Pennsylvania. We were lead by Evan, an extremely knowledgeable and passionate tour guide. Into the limestone and calcite mineral formation wonderland of Lincoln Caverns! The calcite formations within the caves are absolutely stunning. They only get more spectacular as the tour proceeds. The cave also seems to get larger and larger as you proceed as well. Notice the wire-like shapes towards the top of that rock. Those are tree roots that have found their way this deep into the cave. This room was the original entry way into the cave, and it was also the place where they discovered the caverns during the original construction of the William Penn Highway/Route 22 through the area. This is the grand view that captured the imagination of visitors and helped make Lincoln Caverns a viable venture for the better part of a century. The formations look like a giant frozen waterfall. It takes 120 years for one cubic inch of these formations to grow, so you can only imagine how long it took for these to form. This is one of my favorite sections in the cave. This is where you really begin to descend into the cave system. The height in this section, couple with how skinny it is, makes for spectacular sights at this site. 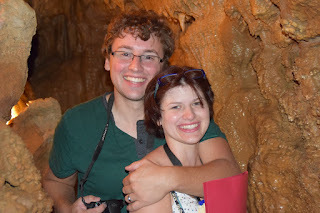 We were having a blast touring the caverns! Our tour guide Evan did a fantastic job. He was so enthusiastic, passionate, and knowledgeable about the caves. His energy really made this tour. Photo by Ed Stoddard. Cave bacon! These calcite formations get more and more elaborate as the tour goes on. The calcite has different looks depending upon the lighting. Our last view of Lincoln Caverns as we ascend to ground level and head to the next cavern, Whisper Rocks, just a few hundred feet up from Lincoln. Hmmmm, what is this? We will find out soon! Myron Sr. had a young son as he was getting started with the cave. Myron Jr as a teenager had determined that there had to be another cave on the property, so he went about exploring and found a sinkhole and noticed that the snowfall in the area of the sinkhole had melted, suggesting that the warmer air from a cave was in the area. He eventually broke through into the cave, and found Whisper Rocks. Here is the entry way into Whisper Rocks. It took twenty years to get the cave cleared out and ready for touring to the public. At the portal, you can see Evan, our knowledgeable tour guide. The first view into the cavern. Whisper Rocks was named for the whispering sound that can emanate through the caverns. On a windy day you can hear a whistling sound from where the wind is able to creep in. The formations within this cave are more intact within this cavern compared to Lincoln, for they realized how much preservation and care needed to be done. I told you that the cave bacon gets better as the tour goes on! You can see the scale of this large room when compared to the height of the guests at the bottom of this picture. The same light breezes that create the whispering sound in the cave, make the formations grow a slightly sideways. A seashell fossil in the roof of the cavern, harking back to a time when Pennsylvania had a completely different climate. Now we've headed out of the cave and headed out onto some of the trails that go throughout the cave property. This is the Sinkhole Trail. It leads towards the sinkhole in which Myron Dunlavy Jr discovered the Whisper Rocks cave. It took three years of digging for him to get into the cave. What is apparent throughout this property is that it was a labor of love for the Dunlavy family. Ann Dunlavy has spent more than four decades at the caverns. It's been in her family for the better part of a century. They are constantly working to teach visitors about the caverns and geology. This institution provides educational tours for students, girl and boy scouts, and more. They do activities such as measuring the CO2 levels in each room to measure the rate of formation growth and much more. The service that this place does for the community and for learners of all ages is amazing. We were hosted by Lincoln Caverns and the Huntingdon County Visitor Bureau. We have shared our opinions about this great place.